A true treasure of nature, ammolite is the rarest of all gemstones and exclusively Canadian. Ammolite is an 'opal like', organic gemstone that is formed from fossilized, extinct mollusks called Ammonites. Ammonites were a squid-like marine animal and existed through out the Paleozoic Era until the end of the Crustaceous Era, when they abruptly became extinct. Ammonites were abundant in all of the oceans and their fossils are found all over the world but it is only those extracted from the Eastern slopes of the Rocky Mountains in Southern Alberta, Canada that boast the captivating, iridescent colours mirroring the brilliance and flashing dance of the Northern Lights. 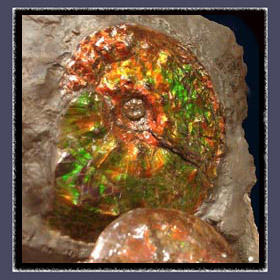 Only 5% of the ammonite fossils in Alberta exhibit 'Ammolite' colours and of these stones only a small portion are considered to be of gem quality. Every Ammolite is unique, showing it own beautiful and intricate patterns, colour combinations and brilliance like a personal signature. 70 - 75 million years ago Ammolite formed from ammonites, but it is a new comer to the recognized gem scene. It was first introduced to the world market in the 1960's and was officially recognized by CIBJO (the coloured stones commission) and bequeathed official gemstone status by the World Jewelry Federation in 1981. Ammolite is the newest of only three new gemstones discovered in the past fifty years. 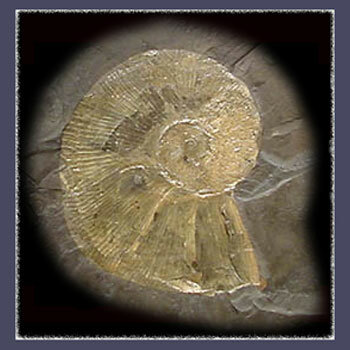 Ancient Egypt is the source for the name 'Ammonite'. Ammon was an Egyptian god who considered the mollusks to be divine. Ammon was represented with the head of a ram featuring the spiral horns,... so reminiscent of the twisted shape of an ammonite shell. Ammonite was regarded by Pliny the Elder (a Roman historian) as the holiest of stones. It was reputed to have the ability to evoke prophetic dreams. Blackfoot Indians first discovered Ammolite in an area bordering the Canadian Rocky Mountains. They called it 'iniskim' (I-nis'kim) or buffalo stone. Blackfoot Legends tell the story of a particularly harsh winter. The buffalo had disappeared and the tribe was starving. A young wife of a Blackfoot brave ventured out in the deep snow to search for firewood. She heard beautiful singing and followed the song to discover an Ammolite stone under a cottonwood tree. A spirit told her the stone was powerful medicine, a talisman to the buffalo and that she should take it back to her people. The woman brought the Ammolite back to the camp of her tribe. The Blackfoot held a buffalo ceremony and the next morning a large herd was spotted by the camp. Ever since that time the Blackfoot has kept Ammolite in a medicine bundle wrapped in buffalo hide and used it for their hunting ceremonies. The fossilized shells of ammonites are composed mainly of aragonite (which is also the mineral that composes nacreous pearls). Ammolite, pearls and amber are the three, biogenic gemstones. Many other trace elements can contribute to the composition of Ammolite including : aluminum, barium, chromium, copper, iron, magnesium, manganese, silicon, strontium, titanium, and vanadium. The luminous qualities of Canadian Ammolite rival those of the famous Black Opal. The finest Ammolite specimens show an 'opal like' play of colour. All of the colours of the spectrum are possible. 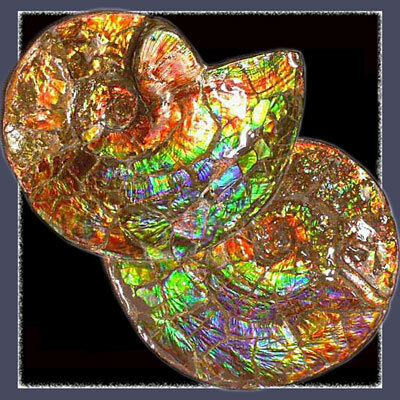 'Interference' of light waves (as opposed to light refraction which colours most other gemstones) rebounding from the stacked thin layers or platelets of aragonite crystals creates Ammolites unique iridescence. The thickness of the aragonite crystals or platelets (lamallae) determines the colour of the iridescence. The thicker, structured layers are predominantly red. Green colouring is the result of less ordered and thinner crystal layers and the blue colours can be attributed to very thin, unordered layers. Given the structure of the crystal layers, reds and greens tend to be the more common colours. The less structured, thinner and therefore more fragile layers resulting in blue and violet colouring are also rarer. The colouring of ammolite is not especially dramatic when it is first quarried. Usually the gem requires polishing or other treatments such as resin impregnation to capitalize on its full colour potential. The fossils iridescent Ammolite layer is actually a very thin crystal sheet, typically 0.5 - 0.8mm. Polishing the Ammolite can leave the remaining gemstone as thin as 0.1 - 0.3 mm. Ammolite has a very low 'hardness', measuring 3.5 - 5.5 on Moh's Harness Scale. These two factors necessitate that Ammolite for the purposes of jewelry be stabilized by resin impregnation, coated with a lacquer or made into doublets or triplets (assembled gemstones). Grey to brown shale, chalky clay or limestone generally makes up the matrix that Ammolite is rarely found without. Ammolite can generally be purchased in three forms for jewellery. 'Naturals' are backed by their original matrix are often a 'free-form' cabochon with a non-coated, hand finish. 'Naturals' are priced by carat weight and the backing shouldn't exceed 1.5mm. Ammolite 'Doublets' have been bonded to a more stable backing and often are a free form shape. The durable 'Triplet' is most commonly used for rings. Triplets are constructed in three layers. Dark grey shale creates the base for the ammolite. Either calibrated optical quartz or synthetic spinel is adhered on top of the ammolite to create a protective layer and to ensure the gem displays it's most brilliant flash. The 'thin' Ammolite layer tended to crack over time and so called 'frost-shattering' is a common feature. Prolonged exposure to the elements and compression by layers of sediment often patterns the Ammolite with a veritable kaleidoscope of designs. 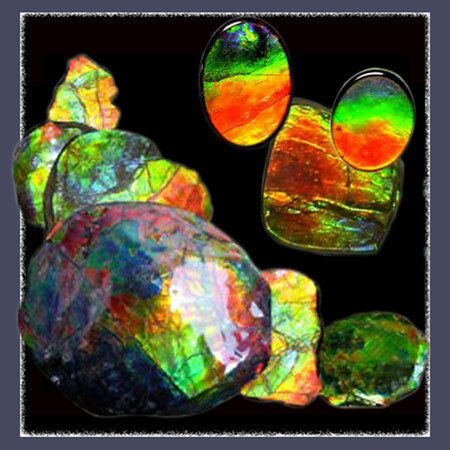 Everything from 'dragon skin' to 'stained-glass', 'cobblestone', 'floral', 'sunset', 'Christmas tree', 'ribbon', 'feathers', 'tin foil', 'suture gem', 'lava lamp', or 'terrain' are used to describe Ammolite surface patterns. Ammolite mined in the 'K-Zone' of the Bearpaw (about 30 meters below the top) formation tend to very compacted and fractured. When the gem is found (usually hand collected) at 120 meters below the Bearpaw formation, it may be entirely smooth or have a rippled surface. The colours of gemstone Ammolite can be remarkable. All of the colours of nature or conceivable in mans imagination can come to vivid life in Ammolite. Every square centimeter can contain an infinite and changing / shifting array of combinations. A strong, bright single colour or ranges of bright colours demark a higher grade stone. Gemstones sporting certain hues like crimson, gold and violet are in highly sought and very rare. The iridescence of the Ammolite is determined by the various thicknesses of its aragonite crystals (lamellae) and the resulting intensity of light diffraction. Superior iridescence is unmistakable. High grade Ammolite is not only brilliantly iridescent; its colours will seem to come alive; changing and dancing over the surface of the gem as the angle of the incident light changes. Chromatic shift is another phenomenon that determines the 'uniqueness' and value of Ammolite gems. The colour shift can be subtle or dramatic and is entirely dependant upon the viewers' perspective and the light sources angle. Monochromatic shift describes a changing of hues within the same primary colour group. On some gems the phenomenon occurs with red changing to gold or green changing to blue, etc. The stones on which this two colour shift occurs are referred to as Dichromatic. Most dramatic and spectacular of all is a Spectrochromatic shift. On an Ammolite gemstone with Spectrochromatic shift colours will shift through the entire rainbow spectrum. A gemstone that is graded 'AA' must show exceptional colour through out an entire 360° rotational range. Light waves can be blocked within the aragonite layers by organic inclusions thus inhibiting light diffraction. When blocking occurs the Ammolite gemstones brightness may decrease, darken to black and not be 'strong' and vibrant throughout a rotation. 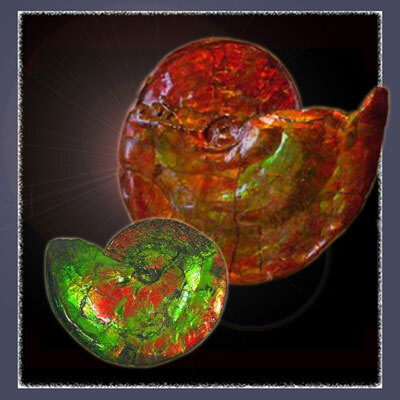 Ammolite has been named the 'Seven Colour Prosperity Stone' by feng shui masters. Ruby Crimson, Fiery Orange, Amber Yellow, Emerald Green, Jade, Azure and Mauve all inhabit the swirling, iridescent depths of the gemstone. Ammolites' colourful radiance is especially important in that each colour is bequeathed with unique attributes. Reds represent love, stimulates energy and growth, oranges enhance creativity and increases libido, yellows are auspicious for wealth, green represents fertility, encourages entrepreneurship and improves intellect and wisdom, blue embodies peacefulness and calmness and promotes health, purples support power and authority. 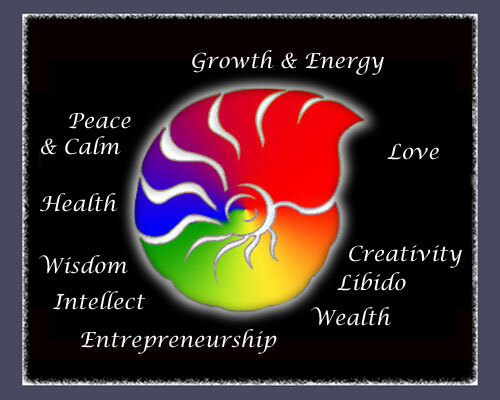 Our bodies and spirits reap rewards from every magical colour in an Ammolite gemstone. Ammolite ... who could ask for more?!! !